"What is your angle? What is the grift over there? Is it liberal or is it fair and balanced? You got to have a take. You got to have a take. Which one is it? Which one are you?" Obviously the veteran newsman has to defend his current employer in public. But here are some angles that have been attributed to Al Jazeera in the past: anti-American, anti-Western, pro-Islamist, pro-Arab. Other Middle Eastern journalists have accused Al Jazeera’s coverage of the turmoil in Egypt of being pro-Morsi and pro-Muslim Brotherhood. In fact, several Al Jazeera staff members quit last July over the network’s biased coverage of Egypt. Colbert actually brought up a good point when he asked Seigenthaler, “But this is the network where bin Laden used to send his gloating tapes, right?” Bin Laden did indeed release numerous video and audio recordings, full of propaganda, to Al Jazeera from 2001 to 2011, and the network willingly broadcast them. This Qatari-owned network has a very sketchy history when it comes to balanced reporting. Take Seigenthaler’s insistence that they are unbiased and have no angle with a grain of salt. STEPHEN COLBERT: Now John, thanks for coming on. You’re a newsman’s newsman, you’ve got all the bona fides. You anchored the NBC weekend Nightly News for what, nine years or something like that? COLBERT: Now you’re the prime time news anchor for Al Jazeera America. COLBERT: Okay. Who got to you and how? Who turned you, when were you radicalized? SEIGENTHALER: Well, I wasn’t radicalized but this summer they approached me and asked me to anchor their prime time newscast. COLBERT: Do they have your family members some place? If this is Stockholm syndrome, just blink and breathe. SEIGENTHALER: No, no, they don't. SEIGENTHALER: My family is safe. 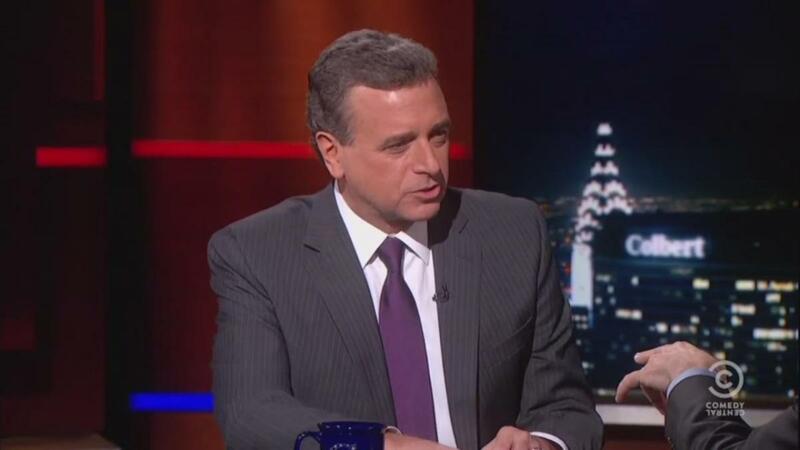 SEIGENTHALER: They offered me the chance to anchor a newscast that focused on serious news. In-depth journalism, unbiased reports. COLBERT: Oh come on. This is Al Jazeera, okay? SEIGENTHALER: This is Al Jazeera America. COLBERT: What is your angle? What is the grift over there? Is it liberal or is it fair and balanced? You got to have a take. You got to have a take. Which one is it? Which one are you? SEIGENTHALER: We have no angle. It's just the news. We just cover the news. COLBERT: Okay, this is why your ratings are like 10,000 people a night. No, but let’s get it on the table. I want to give you the Colbert bump, okay? We’re gonna bump you, we’re gonna get you to like 11. SEIGENTHALER: And you will. But we've only been on four or five months. We just came on in New York probably two weeks ago. COLBERT: Okay. But this is the network where Bin Laden used to send his gloating tapes, right? COLBERT: Which is part of the Al-Qaeda Media Network? SEIGENTHALER: – because it is absolutely not part of the Al-Qaeda Network. SEIGENTHALER: Al Jazeera America is one of the largest news organizations in the world. We have 71 bureaus around the world. We have 12 bureaus in the United States. COLBERT: That sounds like a lot. SEIGENTHALER: We cover 130 countries with broadcasts around the world. We do serious fact-based journalism.